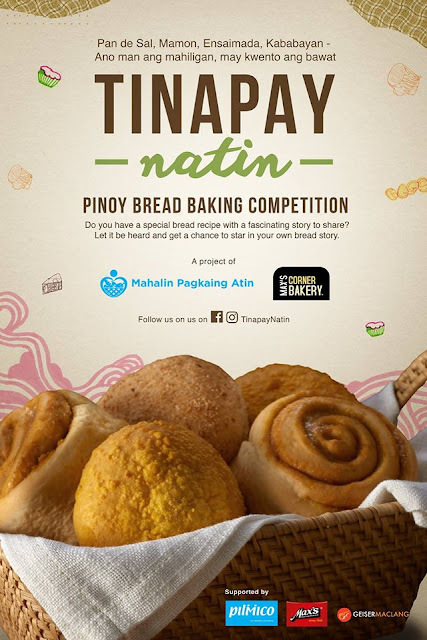 Tinapay Natin Pinoy Bread Baking Competition ~ Philippine Freebies, Promos, Contests and MORE! Do you have a special bread recipe with a fascinating story you wanted to tell? Share it in the Tinapay Natin Pinoy Bread Baking Competition. Form a team of 2 members and enter one (1) regional bread and one (1) modern bread. Fill out the official entry form online, upload the photos of the breads and answer the bread story questions. Entries with the most compelling bread story and recipes will be chosen to participate in the Elimination round. There, you will be assigned ovens and work stations at the designated venue. You will be given five (5) hours to prepare your breads and a maximum of two (2) minutes to pitch your bread story. If you get shortlisted, you will compete in the Grand Finals wherein you will need to bake one (1) more bread, either a regional or a modern bread, in addition to the two breads entered in the Eliminations. Only one (1) team will take home the Grand Prize of P50,000 cash + trophy + medal. Aside from that, one of your bread entries will be sold and distributed at MCB outlets for a probationary period of forty-five (45) days. Max's Corner Bakery will also name your highest scoring bread as Pinoy Bread of the Year. Moreover, your team will get to choose a public school from your region that will be granted a feeding program funded by a part of the sales generated by the new #TinapayNatin. How cool is that! For the winners in the Elimination rounds, each team will receive P10,000 worth of gift certificates from Max's Restaurant and a chance to an exclusive training from Pilmico Research and Training Bakery. What is the historical significance of the bread? How is it a reflection of the region’s people and culture? What story or aspect of your chosen region do you wish to surface through the bread? What traditional Filipino bread inspired this entry? What aspects of this entry were retained from the bread that inspired it? Modern Twist - What changes did you make with this entry to make it suitable to modern tastes? Story - What inspired you to create this bread?